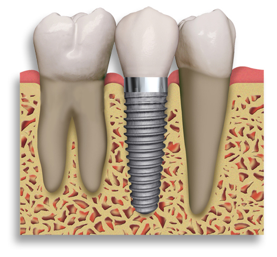 Implants are the ideal solution to replace a single tooth, several teeth or all of your teeth! Dental implants help to support replacement teeth that look, feel and function like natural teeth. Implants help you eat better, they can improve your speech and eliminate the inconveniences of removable partial dentures. Anyone who is missing their teeth due to decay, trauma or disease is a candidate for an implant. There are two parts to teeth, the crown which is visble, and the root which is under your gum in the bone. Implants help to replace both! First, the titanium implant is placed into your jawbone, acting as the root. After 3 to 6 months of healing, we can place a crown on top. The initial visit takes only about an hour. It is a relatively simple procedure, requiring only dental "novacaine." At the 2nd appointment to fit the implant crown, "novacaine" is not usually needed! Implants eliminate the need to grind down adjacent teeth to do a bridge, and they also can't get cavities! With implants, there is no need to use adhesives to keep dentures in place. Dental implants can restore chewing efficiency. The average denture patient without implants only chews with 20% efficiency. With an implant-supported denture, chewing efficiency almost equals that of natural teeth. Implants also help preserve the bone in your jaws to maintain the natural shape of your face. Initially, implant treatment may be more expensive than other treatment options, but it is the best long term investment since implants can last a lifetime. Since implants are a highly predictable treatment with success rates over 90%, they are the ideal solution.